p. 300: note * vs : for denoting interactions; notations differ, but R uses a*b to signify "main effects of a and b and their interaction" and a:b to signify just the interaction (that is, a*b is equivalent to a+b+a:b). p. 301: figure 9.2 was uglified by PUP! p. 302: there's a bit of a problem with adding an interaction between two continuous covariates (x1*x2) without adding the quadratic terms (I(x1^2)+I(x2^2) at the same time, because the model isn't entirely consistent. 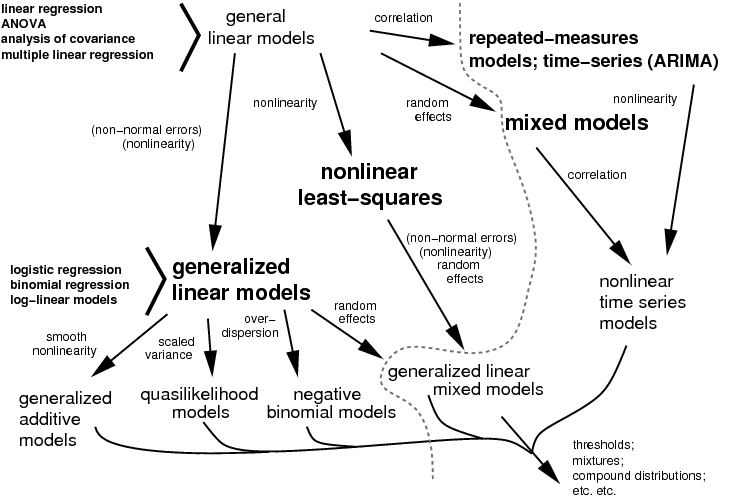 p. 303: note that linear regressions and ANOVA give you different kinds of summary statistics of the same model — e.g. 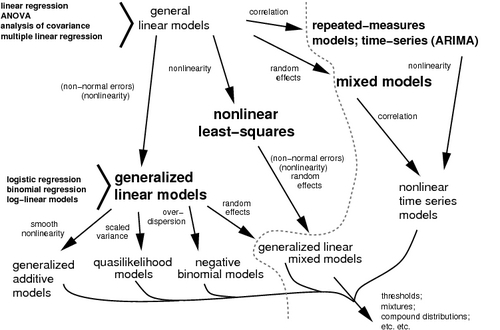 a table of F statistics for the effects of each variable vs. a table of Wald statistics for each parameter. p. 310: I can deal much more thoroughly with fitting type II functional responses via GLM (i.e., using an inverse link), and with the hyperbolic vs exponential function question. See this discussion. p. 311: not sure "quasilikelihood" is dealt with with entirely consistently but I may not be able to deal with it sufficiently thoroughly here anyway. p. 313 I think AICtab can now compute quasi-AIC. I'm still uncomfortable about QAIC, although Richards 2008 (Dealing with overdispersed count data in applied ecology, J. Appl. Ecology 45:218-227, doi:10.1111/j.1365-2664.2007.01377.x) suggests it's really OK.